Please write “SAMSON WASAO” on the check memo line or in the memo or account field in your online bill payer. Samson Wasao was born in Kenya. He and his wife Patricia, have three girls. Samson gave his life to Christ as a teenager in high school. He went on to the University of Nairobi, where he developed a deeper knowledge and closer walk with Christ as he was discipled and mentored by missionaries with The Navigators in Kenya. After graduating from the University of Nairobi in 1980 with a BA (economics) degree, Samson worked for the government of Kenya in the Ministry of Agriculture. During that time, he earned a scholarship from the Harvard Institute for International Development to study agricultural economics at the masters level at The Ohio State University in Columbus, Ohio. At Ohio State, Samson joined IFI pioneers Phil and Ruth Ann Saksa and Mabel Bahler. Samson actively and faithfully ministered among fellow internationals throughout his student life in Columbus. Upon graduation in 1985, he returned to Kenya, where he met and married Patricia. They returned to Ohio State together in the Fall of 1988 for Samson to pursue a PhD. As a couple, Samson and Patricia rejoined IFI and were an integral part of the ministry on the OSU campus throughout their time in Columbus. They joined a group of four other married couples with whom they met weekly for Bible studies. Their conviction and vision for strong and stable marriages built on the eternal principles of God’s Word was developed during their interactions in these couples’ Bible studies. They grew spiritually stronger as they applied the powerful relational principles of God’s Word in their own marriage. They opened their home to internationals and Americans and saw God use them to encourage and challenge individuals and couples to live for Christ. 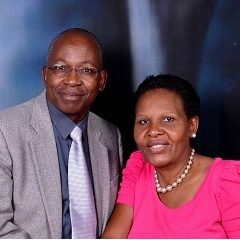 Samson graduated in 1995 with a PhD and returned to Kenya in 1996, where they were actively involved in church ministry, helping to develop the married couples’ ministry and pioneering the development of the family care and enrichment structures and policies for the Christ-is-the-Answer Ministry churches in Nairobi. Samson has worked as a researcher and program manager for various international organizations, including the Population Council and the United Nations Development Program. He has managed projects and programs that promoted participatory and sustainable development in Kenya and also worked as a Director of Programs with the African Institute for Development Policy, a regional NGO based in Nairobi, which he left to join IFI. Samson and Patricia have a passion for ministry among married couples. They have provided leadership in preparing young people for marriage through structured and regular premarital counselling classes as well as by mentoring couples in their first years of marriage. Samson and Patricia are developing IFI’s family care ministry, serving not only international students and their families in the Columbus area, but also being a resource to staff in family concerns and other areas. Support needs: To serve with IFI, Samson and Pat need a team of people to pray, give, and work alongside them. Will you prayerfully consider being a part of their team? For their reintegration as a family back into the USA.